If you’ve been on the site since the beginning you may remember that before Brandon started here that we didn’t update the site on Mondays. Mondays are normally one of my days off. This past Monday was a rainy mess of a day. To get everyone out of the house we loaded up the car and rolled my son the local Toys R Us. After checking out the Lego, Nerf, and Superhero stuff I found some pure awesomeness on the pegs. Behold the animal Pez dispenser. I am not a giant candy person. I’ll take potato chips over candy 99% of the time. 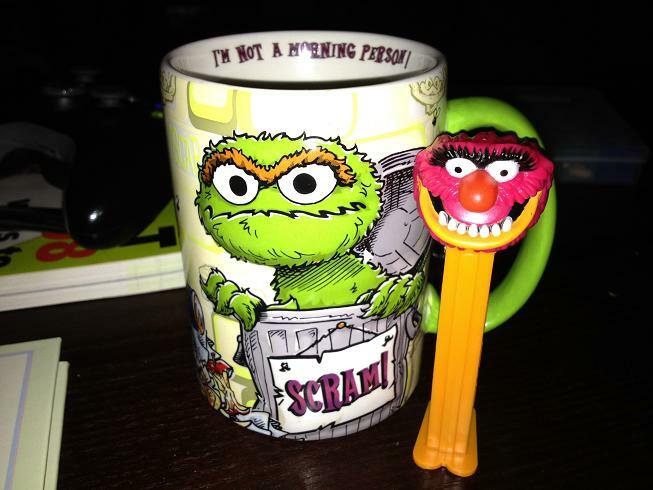 There is something about Pez though. I don’t cheat either; I never eat a packet of Pez without loading it into the dispenser. Years ago when I was deep in MMO addiction I always had a Pez dispenser with me as I played. The process of loading the candy before you eat it slows the whole process down too, so it takes you longer to eat them all. Anyway, they had the whole Muppet lineup there, but I’ve already said on the blog that Animal has always been my favorite Muppet. They actually have a pretty good sculpted likeness too. A lot of Animal merchandise doesn’t look quite right. We also got my son a “My First Cookie Monster”, apparently Cookie Monster has delicious eyes. I Hath Returned To The Mortal Realm!